Summary and Definition: The Creek tribe, aka the Muskogee, descended from the mound builders located in the Mississippi River valley. The people moved across the southeast and established large, organised settlements in Georgia, Alabama, North Carolina and Florida. The Creek people were farmers growing crops of corn, beans, squash, melons, pumpkins and sweet potatoes. The most famous Creek chiefs were Red Feather and Osceola. The above picture depicts Steeh-tcha-kó-me-co, meaning Great King (called Ben Perryman), who was a Chief of the Creek / Muskogee. It was painted by the famous artist George Catlin (1796-1872) at Fort Gibson in 1834. The chief wore a fringed, tasselled, buff colored matchcoat, basically a blanket that was wrapped around the body, and this instance was hung over his shoulder. He wore decorative sashes across his chest and around his waist. His turban style headdress was worn by many of the southeastern tribes and made with strips of calico cloth wrapped around his head like a turban. What was the lifestyle and culture of the Creek tribe? The Creek tribe, who call themselves the Muscogee, are descendants of the Mississippian culture people, who built earthwork mounds at their villages located throughout the Mississippi River valley (refer to the Natchez Tribe for more facts about the mound building Native Indians). The Creek people established villages across the Deep South but their numbers were diminished by the diseases brought by the Europeans. During the War of Independence the Creek people who aligned themselves with the Americans were called White Sticks. Those who had sided with the British were called Red Sticks, supposedly due to the red-colored war clubs that they carried into battle. Following the War of Independence the 'civilizing programs' began. Many Creeks adopted European practises such as European style dress, houses, farming techniques, cotton plantations, the use of slaves and the Christian religion. The Creek War (1813–1814), also known as the Red Stick War, erupted in Alabama and Georgia as American settlers continued to encroach on Creek lands. The Creek people were forced to relocate to Oklahoma in the 1830's and many Creeks fled to Florida where they found sanctuary with the Seminoles. 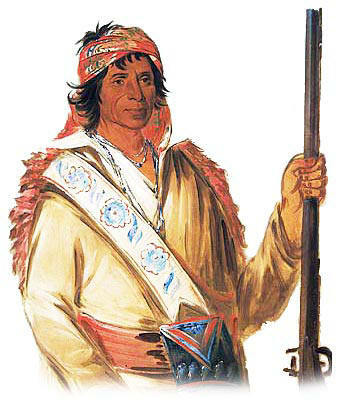 The Creeks in Florida became embroiled in the Seminole Wars, led by the Red Stick Creek leader Osceola against the forced re-location of Florida Indians. The wars ended in defeat and the people were sent to reservations and the Creek tribe became known as one of the Five Civilised Tribes who also included the Cherokee, Choctaw, Chickasaw and Seminoles tribes. The culture and social structure of the Creek people included a judiciary system, a written constitution, two legislative chambers and a public school system. Where did the Creek tribe live? The Creek are people of the Southeast Native American cultural group. The geography of the region in which they lived dictated the lifestyle and culture of the Creek tribe. What did the Creek tribe live in? The Creek tribe lived in different styles of shelters over the years. The Mississippian culture people built earthwork mounds at their villages with grass houses. These early houses were built using a framework of poles and beams covered with wattle and daub mud. The walls were then covered by cane mats and a thatched grass roof. The next style was the wattle and daub house made by weaving river cane, wood, and vines into a framework, then coating the frame with mud. The roof was either thatched with grass or shingled with bark. 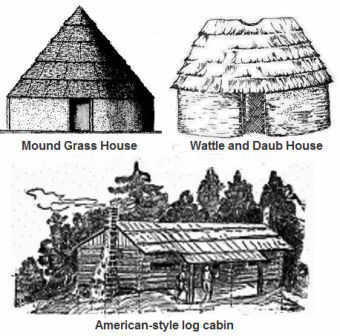 The American settlers brought new ideas and strong, sharp tools that replaced the stone axes and in the 1800's some of the Creeks began to build American-style log cabins. What language did the Creek tribe speak? The Creek tribe spoke in several related dialects of the Muskogean language family. What food did the Creek tribe eat? The food that the Creek tribe ate included their crops of corn, beans, squash, melon and sweet potatoes. Creek men also hunted deer (venison), wild turkeys, and small game. In the 1800's they extended their farming activities to include cows, horses and pigs. What weapons did the Creek use? The weapons used by the Creek Native Indians included war clubs, maces, knives, bows and arrows, pikes and axes. The Europeans introduced muskets and then rifles. What clothes did the Creek people wear? Prior to the late 1700's the Creek men were breechcloths made from deer skin or bark fabric. The early Creek women wore a knee-length skirt, also made from deerskin or a bark fabric. The above picture of the chief show how the clothes worn by the Creek people were greatly influenced by the Europeans and the availability of trade cloth. Creek History: What happened to the Creek tribe? The following Creek history timeline details facts, dates and famous landmarks of the people. The Creek timeline explains what happened to the people of their tribe. 1500's: The Creek Alphabet was developed using symbols for letters. The Creek Alphabet was created by the ancient Taliwa people, believed to have descended from the Mound Builders. 1813: Creek War (1813–1814) erupted in Alabama and Georgia. White settlers continue to encroach on Creek lands. For additional facts and information refer to the legend and the Story of Osceola, the War with the Creek Nation and the story of Old Fort Mims.